The RC-1 is BOSS' simplest and most user-friendly Loop Station ever, and it's a ton of fun. Since the RC-20 Loop Station was first released in 2001, BOSS has led the way by continually releasing new looping products. Though they've been used and enjoyed by various looping artists and performers, BOSS still pursued an easier and more affordable solution. The RC-1 is a straightforward looper that is easy to operate. Experience the fun of looping when you record, playback, overdub, and undo or redo loops using this compact BOSS stompbox. The RC-1 also retains the BOSS quality and performance that musicians around the world have come to expect and rely on. On the top panel, there is a new and innovative loop indicator, which consists of a 24-segment LED laid out in a circular pattern. You can quickly and easily determine the current status of the Rec/Overdub/Play modes. With a maximum 12 minutes of stereo recording time, the RC-1 is capable of capturing any extended performance that you can create or imagine. The stereo in/out jacks can be used with stereo effects and amplifiers. Additionally, they allow you to connect stereo instruments, such as synthesizers. Other convenient features include battery and AC power, as well as flexible external footswitching capabilities. The RC-1 is an especially great partner to start enjoying looping. Designed with guitarists and bassists in mind, the RC-1 is all about instant musical satisfaction. Lean, mean, and housed in the rugged BOSS compact pedal case, the RC-1 lets you experience the fun of spontaneous loop creation with no complicated controls or features to get in your way. All looping functions can be accomplished with only the integrated pedal switch: record, overdub, play/stop, undo/redo, and clear. That may sound like a lot on paper, but in practice, it's incredibly natural to operate the RC-1 while playing. Beyond the pedal switch, the RC-1 has only one other control to be concerned with-to adjust the loop volume, just give the Level knob a twist. That's it. Of course, you'll want to see what's happening while you're working with the RC-1, and the unique circular Loop indicator provides a wealth of info in a simple way. Via the indicator's 24 multi-colored LEDs, you get instant feedback on the current operation mode, plus the timing of the current loop. 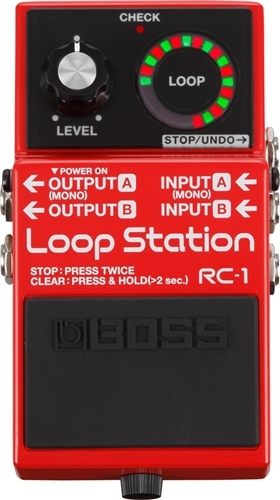 The BOSS RC-1 Loop Station delivers instant looping gratification with no hassles. The RC-1 Loop Station offers excellent sound quality to keep your tone intact and has up to 12 full minutes of stereo recording time for capturing super-long loop jams. The last loop session is stored in memory even when the power is turned off, so you can pick up right where you left off at the next practice session or gig. With up to 4.5 hours of battery operation, the RC-1 is a great looper for street performing, open-mic nights, and other situations where AC power is not readily available or you need to setup in a hurry. Of course, the pedal can also be powered by the industry-standard BOSS PSA-120s power adapter (sold separately). Just like other BOSS compact pedals, the RC-1 fits nicely onto a pedal board alongside your favorite stomps. It can be used as a mono looper in a standard setup with a single amp, or in true stereo when chained in more sophisticated rigs with stereo modulation, delay, and reverb pedals. Going beyond guitars and basses, the RC-1's stereo I/O is perfect for synth players and other musicians that use instruments with stereo outputs. WxHxD: 73mm x 129mm x 59mm, 2-7/8" x 5-1/8" x 2-3/8"